Lysa & Huey Ink! : The Brick Project! Check out my really cool brick! Ok, So to you all it is a normal run of the mill brick. To me though it is so much more. I have a whole long winded back story to that little brick. Let me start at the beginning. I live here in New Jersey in a very large "small" town called Woodbridge. I wasn't raised here but I like to think of myself as one of those die hard Woodbridgeians. After all I have lived here longer than I have lived anywhere else, so to me I qualify as a native. This town is very old and we have wonderful history. Chartered in 1669, the town has grown to become a hub for central Jersey. I could go on and on with historical facts and such but what I really want to tell you about is that brick. The brick is from the towns original Memorial Municipal Building that was dedicated on June 14, 1924. The building was dedicated and named for our serviceman. We carry that on to this day. We truly honor and appreciate all who have served and currently serve. That brick is almost 90 years old! The day the building was dedicated the whole town came out to celebrate and honor our deceased servicemen as well as those who returned. The thing is the building was demolished in 1994 to make way for our new modern and safer Memorial Municipal Building. When the building was demolished all these awesome bricks were left in a pile waiting to be hauled away for recycling or trash. Many people as they passed by picked up a brick. Lots of people saw them as a keepsake or a souvenir. Maybe they just saw them as a memory of a building that they loved. Really, when you think about it what are you going to do with just 1 brick other than look at it every now and again. Yet, all over the place I would see these bricks. I mean, I would see them in peoples houses just sitting on a shelf. I see them in peoples cubicles at work, just kinda laying around. Well, the more I saw them, the more I wanted one. I mean like, I really wanted one. I actually started asking people if they would part with their precious brick but I was always met with a firm "NO"! How is it I never picked one up? I lived here in 1994 when the building came down. I guess it didn't hit me back then that it was a pretty cool brick. Well as the saying goes "good things come to those who wait" (and I have been waiting since 1999) and sure enough back in December a friend (Hi Mary C.) tells me there are some bricks up for grabs from someone down at the Chamber of Commerce who is getting rid of some things. YES!!! I could not respond quick enough. "I'll take 2, thank you very much!" (as I type this I can hear my inner voice screaming SCORE!) So there you have it, I am now the happy (and crafty) owner of not 1 but 2 bricks! Then I started to think of what am I going to do with the bricks. Oh please .... Its always scary around here when I start thinking. So I get it in my head that everyone and his brother is going to want a little keepsake. Something more than an old brick laying around or just propped up on a shelf. (here comes the part where I start to drift off and I hear music faintly in the back of my brain) Yes, I remember I was in Donna's car driving to a Christmas luncheon . . . her ignition keys were swaying back and forth, kinda clanking together . . . and that's when it hit me. I turned to all in the vehicle (Hello Joanne, Hi Nadine, Hey there Donna) and I said "I know what I am going to do with my brick!, I am going to shave little pieces of it off and embed it in acrylic and make a key-chain out of it!" Oh yeah! doing the happy dance in the seat of the car! and wait, "I know . . . I am going to give the first one to the Mayor! He will love it!" Than I smiled and breathed a sigh of relief because I knew I had an idea. Once I returned from lala land and looked up I noticed all in the car were giggling and laughing at my crazy idea. Really people, laughing! It's an awesome idea. (oh please, all the greats are laughed at) I can't believe you 3 can't see the key-chain dream. "Don't like key-chains, well how about a refrigerator magnet"? (insert more laughter here) and so it goes. . . Here I am a crafter with a key-chain dream. Now, just like any awesome crafty good project, research is involved and as you know from my UTEE post burnt fingers were involved as well. Plus there would be research for the perfect graphic too. So with out boring you even more for today I will leave you with this picture of "old" Town Hall. 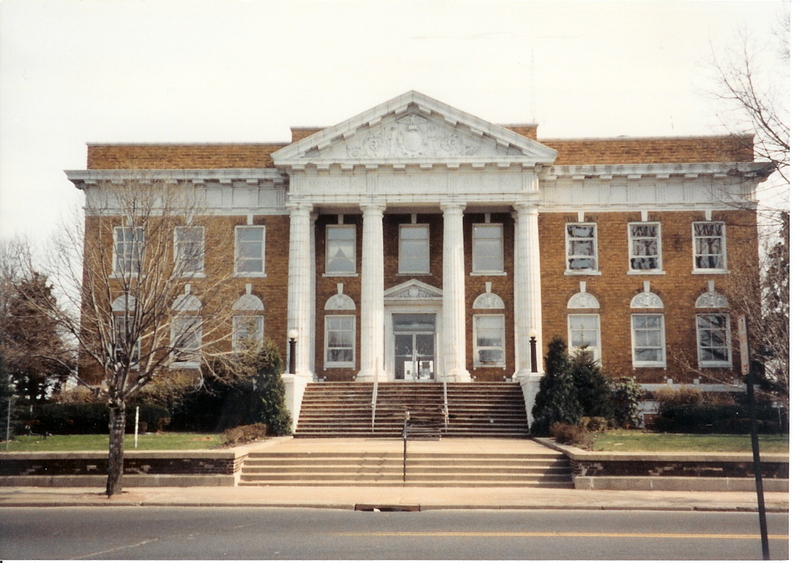 It's clear to see this building not only did its utilitarian job as it stood proudly in the center of our town, it captured the heart of our community so much so that people felt the need to pick up a brick and save it. Thanks for visiting and if you want to see what happens to the brick check back in a week or so. The Brick Project ... Done! Lindt Bunnies - I Love 'Um!